Our big trip started at 5:00 A.M… still dark outside. Our friend, Gerry Noll, would be riding Amtrak with us and then joining us on the first two days of the Katy Trail. Gerry met us at our house and off we went into the darkness down New Florissant Road to the UMSL-North MetroLink Station. I was still too groggy at this point to be nervous about the upcoming trip. We had a long day ahead of us. Three sleepy bicyclists pushing their fully loaded bikes onto the MetroLink at 5:30 in the morning must have looked a bit strange. But the few early morning MetroLink passengers had their dissinterested commuter faces pasted on so I have no idea what they thought about us. Thank goodness Gerry had checked the Metro website the week before and discovered that part of the MetroLink was closed this particular weekend so we had to disembark at Wellston and ride the roads down to the Skinker station to get back on the MetroLink. I was prepared for the detour with a map. Would have been a rude surprise if we had found out about it that morning. We had a train to catch afterall. On the maps it looks like the Amtrak Station is right next to the Civic Center MetroLink Station. But when we got off the MetroLink we couldn’t figure where the Amtrak Station was so we went for a frantic little ride in downtown St. Louis looking for it. We could see the train tracks but no station. Fortunately it was daylight by now and only light traffic. A helpful pedestrian gave us directions to get to the station (of course in the opposite direction we were going) so off we went. Then we heard him yelling and running after us pointing the other way. Surprise surprise, he had just noticed the brand spanking new Amtrak/Metro Station behind us. The entrance was only about 15 steps away from where we had originally gotten off the MetroLink. DOH! So into the station with our loaded bikes… but the lady behind the desk explained that the Amtrak Station hasn’t officially moved to the new building yet. *sigh* She directed us through the parking lot, down a narrow board covered walkway into a little box that is currently the Amtrak Station. We squeezed into the little boxy building with about 50 other folks and waited in line to pick up our tickets. 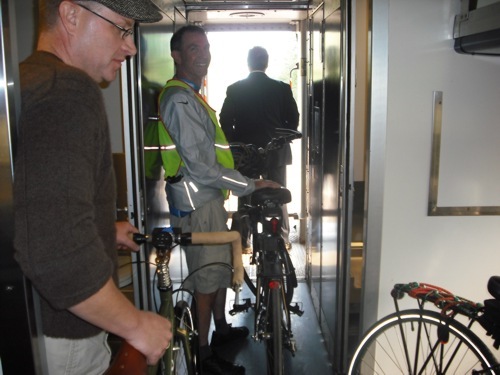 Now for the big test… would we be able to bring our loaded bicycles onto the train? 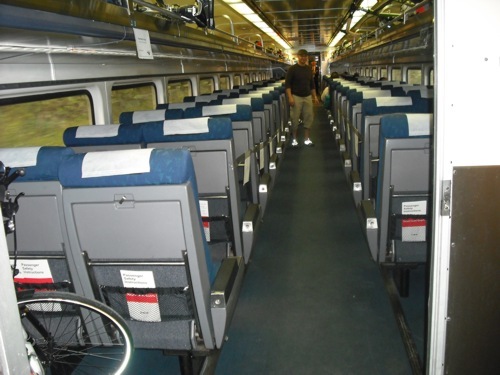 I had called the Amtrak office twice and Gerry had also called to verify that yes, the bikes can be rolled onto the train and placed into the bicycle racks. We asked the lady at the Amtrak desk and she told us the same. We even had purchased special tickets just for our bicycles. No problemo! So we wheel our bikes to the train and you guessed it… the conductor told us that there are no bicycle racks. None of the trains have bicycle racks, he says. Okay !@#!$%! Fortunately he was just about as nice as a conductor could possibly be and he helped us strongarm our very heavy bikes up the steep steps and then unload our gear piece by piece and get all the gear in the overhead racks. Of course in the meantime, the line of happy folks waiting behind us was lengthening which made the process a bit frantic. By this time another conductor was also helping. Gear was flying everywhere. My bike got squashed into the space behind the seats. 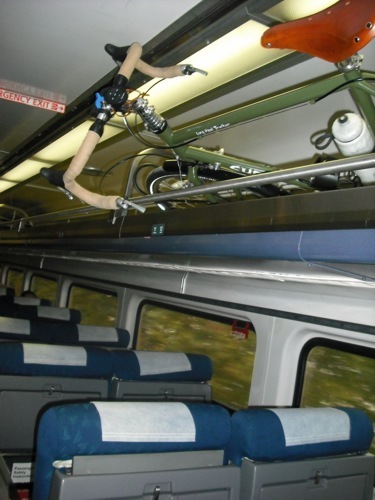 Craig’s and Gerry’s bikes got shoved into the overhead compartments. I couldn’t bear to watch Craig’s face as his beloved Surley was pushed back into the rack. But Craig handled the dire situation admirably and everyone remained alive with limbs intact. Craig’s Surley Long Haul Trucker confined to the rack. Except for the lack of bicycle racks, our Amtrak experience was very nice. The trains are nice, the seats are comfy, and they’ve got the friendliest crew I’ve ever experienced on any sort of public transportation. We also enjoyed the dining car with benches and tables and a snack menu. It was a pleasant way to spend four hours. 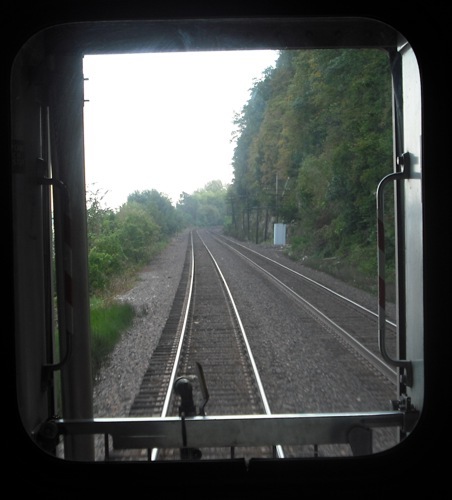 The view from the back of the train. Our friendly conductor started getting us ready way ahead of our Warrensburg destination. We piled all our gear in the back of the train and assembly lined the bikes and gear off the train when we arrived. It was a much more organized and planned affair than our entrance had been. Gerry and Craig waiting at the back of the train to exit. Our friendly conductor stands authoritatively behind Gerry.